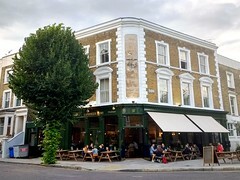 Gastropub in Upper Holloway. It was previously known as the Landseer photo. The front part is light and airy, with a high dark red ceiling set off by paler walls, large windows, long unvarnished wooden tables, and a few sofas photo. Happily, some of the wooden chairs have cushions perched on top for extra comfort. This part is for drinking; there's a dining area out the back too, with napkin-laid tables. There's also a little snug part to the right of the bar, with shelves of books. Several picnic tables are out the front, though they're not covered or heated. Kake visited on a Thursday afternoon in April 2009. The three handpumps on the bar offered Summer Lightning (the guest, priced at £3/pint), Adnams Bitter, and Marstons Pedigree (a temporary replacement for the usual regular of Timothy Taylor Landlord). Young persons' music (e.g. Moby) was playing, at a volume which would perhaps have been a bit too loud if there had been anyone else in and chatting. According to a menu seen in April 2009, food is served noon-3pm and 5pm-10pm Mon-Thu; noon-3pm and 5pm-10.30pm Fri; 11am-10:30pm Sat; and 11am-9:30pm Sun. I didn't stay for food, but it looked interesting. The tapas menu photo also looked quite interesting. They also do bar snacks priced from £2.50 menu photo. Accessibility: No step to get in, and level access to bar, seating areas, and toilets once you're in. Some of the tables are a bit close together though. Last visited by Kake, 30 April 2009. Last edited 2017-12-01 14:20:35 (version 7; diff). List all versions. Page last edited 2017-12-01 14:20:35 (version 7).